This could get a littly messy . . . 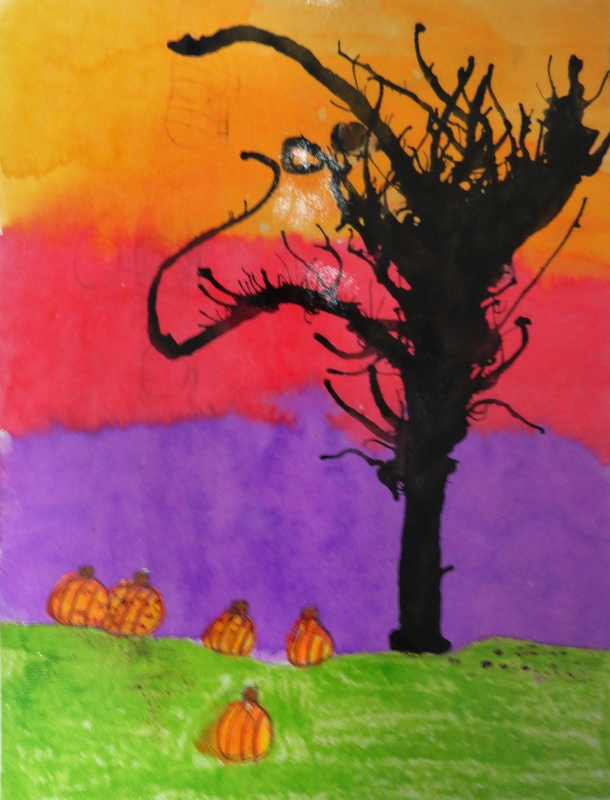 I repeated the straw blown trees with 2nd grade the next year, but this time we added a spooky twist . . . and I think we ran out of blue watercolor paint so we had to improvise! Orange, red, purple, and yellow water color paint. Working vertically, draw a horizon line near the bottom of the paper. To know where you should draw your line, take your left hand and lay it flat on your paper with fingers together. Line up your pointer finger with the bottom of the paper. Make a mark right above your pinky. That is where your horizon line should be. Lightly draw with your pencil. Then, draw 4-6 pumpkins on or below your horizon line using your pencil. Make sure to leave a space for your tree on the horizon line. 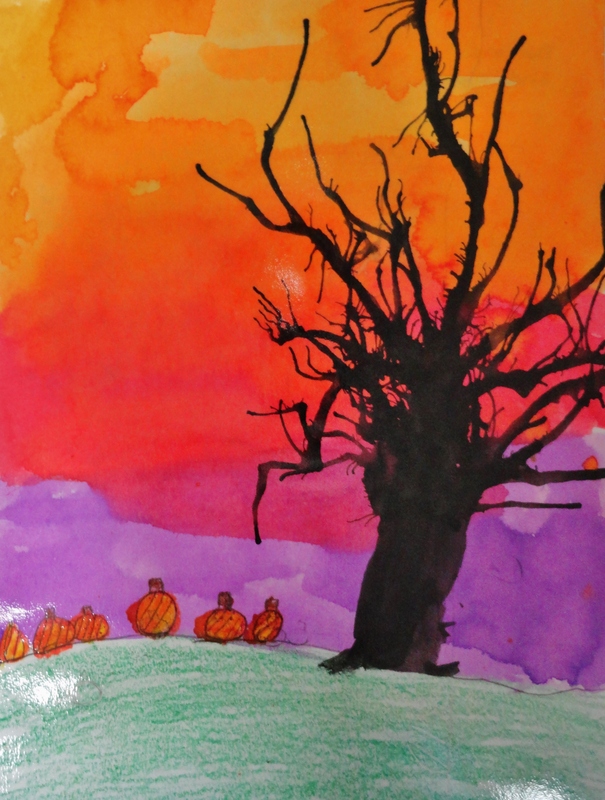 The class and I drew pumpkins together before this step on a scrap sheet of paper. For religious reasons, kids were not encouraged to make faces on their pumpkins, but if they did that was fine with me. Using a red-orange crayon, trace your pumpkin and the vertical lines on your pumpkin. Make sure to push hard. Color in your pumpkin with the orange crayon and trace your stem using a brown crayon. Color in your grass using a green crayon pushing hard. Now it’s time to paint! I put only the yellow paint out first and work my way through the dark hues. Paint over your grass using the yellow watercolor paint. Rinse your brush! Using the orange watercolor, paint the top third of your sky. Rinse your brush! Paint the middle of your sky using red watercolor. Don’t leave any white space in between your orange and red paint. Rinse your brush! Lastly, paint the bottom part of your sky purple. Rinse your brush. Let dry. We waited until the next day to paint the trees. Using the black india ink and paint brush, paint a tree trunk on your horizon line. The tree trunk only needs to be about an 2″ high. Now, take your paint brush and dip it into the india ink. Make a little puddle at the top of your tree trunk. Take your straw and blow the ink up and across your paper to make branches. Continue to make ink puddles on your trunk or on branches and blow the ink in various directions. Let dry and have a happy fall!